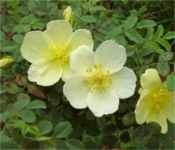 A small shrub rose spreading underground by rhizomes, this species is native to much of the US. Blooms are pink and are followed by red hips, which are used to make teas, syrups and jams and are rich in vitamin A,C and E and flavanoids. The roots have been used to treat bleeding and eye complaints. The plants are very adaptable and grow well in a wide variety of soil types and light levels. Hardy to -30F (-34.4C); height: 18in. Large shrub with graceful arching branches and yellow blossoms about 2in. in diameter. Good species for hedges, dappled shade under other trees and borders. Hardy to -20F (-28.8C); height: 9ft. Thorny stems form a thick tangle. Red or purple-red blooms are followed by large tomato-shaped hips. Hardy to -50F (-45C); height: 6ft. 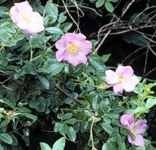 Native to the eastern US and Canada, this pretty rose has small fragrant pink blooms and blue-green foliage. It has an upright, rounded growth habit, and does not become invasive, so makes a good variety for wildflower gardens. In the autumn, bright red hips appear, and the foliage turns golden yellow. Hardy to -30F (-34.4C); height: 3ft.